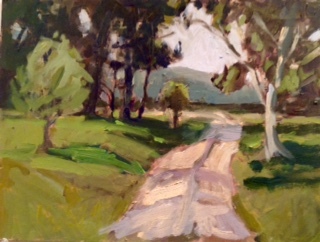 Kate McGloughlin — Kiesendahl + Calhoun Fine Art, Ltd.
30 x 36, oil on canvas. 7.5. x 11, oil on paper. 6 x 8, oil on panel. 5 x 7, oil on panel. Born in 1962, a native of Olivebridge in New York's Hudson Valley, Kate McGloughlin graduated from the University of Arizona at Tucson with a Bachelor of Fine Arts Degree in Drawing & Painting in 1985, where she studied with Bruce McGrew and Robert Colescott. McGloughlin has been included in Marquis Who's Who in American Art since 1999, and Who's Who in American Women since 2005. 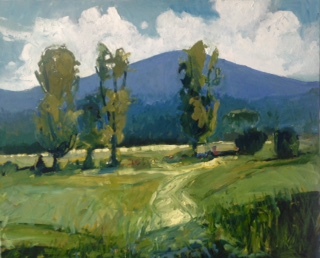 She teaches landscape painting and printmaking workshops in Italy, Mexico, Ireland and the United States, and is represented widely in the US.